SALT LAKE CITY—A stellar season for the Badgers came to a non-stellar end. 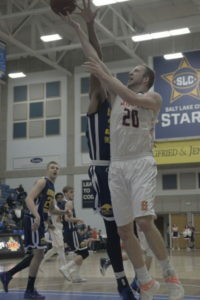 Snow College’s men’s basketball team was the victim of a 92-82 upset by an underestimated Southern Idaho squad in the Scenic West Athletic Conference Championship game. Prior to the championship game, Snow took down USU-Eastern, 83-60. The loss came as a shock due to the 4-0 record of the Badgers against Southern Idaho during the regular season. Prior to the tournament, Southern Idaho jumped into the national rankings, ranked No. 23, ahead of No. 24 Snow. The Eagles got the higher ranking courtesy of convincing wins over Salt Lake and a dominant preseason. In the first round of the SWAC tournament, the top-seeded Badgers hosted the Golden Eagles of Utah State-Eastern; USU-Eastern had just won the play-in game against Colorado Northwestern. Nevertheless, Snow controlled the ballgame nearly from start to finish. Sans their top player, Quinn Peters, the Eagles couldn’t keep up with the high-profile Badger offense. Even below their normal shooting percentage of 50 percent, Snow shot 44 percent and hit a high volume of their shots to keep the Eagles at bay. Snow and USU-Eastern played a competitive game during the first half, with Snow taking the halftime lead, 39-31. The Badgers shot only 37 percent in the first half compared to the Eagles’ 43 percent. During the second half, the Badgers started to run away with the game. An early 11-0 run opened up a 20-point lead for Snow, highlighted by a quick takeover by freshman A.J. Jones. By the end of the game, the Badgers got quality time from their bench players. Snow’s backups combined for 18 points. At one point in the game, Jones was on the court as the floor general of four bench players. Meanwhile, the Eagles struggled, having three players foul out. Despite a slow first half, freshman Zach Hunsaker got back on track in the second to lead the Badgers with 21 points. Sophomore Blake Truman posted an impressive double-double with 20 points and 13 rebounds. Jones put in 14 points, while sophomore Nate Bruneel chipped in 11. Jones also had four steals, part of a Badger defense that created 20 turnovers. Things went south in the championship game against Southern Idaho. The Eagles established control early on, maintaining a small and steady lead over the once-again colder-than-normal Snow offense. The Badgers couldn’t buy a three-pointer in the first half, going 2-11 from outside. Meanwhile, the Eagles were getting quality offense out of their starters en route to a 36-29 halftime lead. Most of Snow’s meetings with Southern Idaho this season resulted in come-from-behind victories for the Badgers, and for a time, it looked like it would happen again. Snow took advantage early in the second half, tying up the score at 42 at the 16-minute mark off a layup for sophomore Riley Panter. The Badgers weren’t finished there as they stormed out to a ten-point lead with 13 minutes remaining. Unfortunately, the Eagles stormed back. Southern Idaho’s Danya Kingsby led the counter-charge. Kingsby, who only scored two points in the first half, exploded for 26 points in the second half to rapidly overcome the Badger lead. With two and a half minutes remaining, the Eagles had jumped out to an 11-point lead and never looked back. Snow’s season ends with a 25-5 record, highlighted by a national ranking and a 15-0 record at home.